We all know the golden rule: Never show up to a party empty-handed. Of course, there’s always the standard bottle of wine or a scented candle, but if you’re on the hunt for something unique, there are plenty of creative ways to express your gratitude. And, keep in mind, host and hostess gifts don’t need to be expensive or elaborate. In fact, some of the most thoughtful gift ideas are under $25. And, as long as the gift is personal and allows you to reciprocate your host’s hospitality, it will be well-received. Here are some of our favorite hostess gifts to give this holiday season. Get the wine enthusiast on your list the gift of style and convenience. The Oster cordless electric wine bottle opener makes it easy to start the night off on a sophisticated note. In just a matter of seconds, with the simple push-button operation, you can open up to 30 bottles of wine on a single charge. So, naturally, if that exact scenario ever presented itself, at least you know your wine opener can handle the job. Who knew you could make wine more fun? It’s the gift that keeps on giving! Capture all of the unforgettable moments of the night and create tangible memories with the help of a Polaroid camera. Best of all, everyone can join in and take turns snapping photos of the festivities. Plus, once the photos develop (in 3-4 minutes), guests can view them in their hand rather than on a phone as we’re all accustomed to. Overall, a mini Polaroid camera is a wonderful gift that’s both nostalgic and so simple to use. Just make sure to bring extra film with you! Everyone loves a good party game, and that includes everything from classic board games to current card games and more. Bring the fun and get the whole party involved in a competitive game of Twister, Jenga, Operation, or Monopoly (if you have the endurance). Or, perhaps you wish to gift the host with a newer game, like Cards Against Humanity, Hot Seat, or What Do You Meme. Either way, hilarity will ensue. At the end of the day, what could be a better hostess gift than Garry’s desserts? Our bakery has pastry options that are made in-house by our very own Pastry Chef, Natalie Boden. Of course, brownie trays and mini cheesecakes are a crowd favorite at any party! We can also custom prepare a round cake/pie or sheet cake of your choosing. Not to mention, we have seasonal dessert options as well, including Strawberry Shortcake, Key Lime Pie, and Apple Autumn Cheesecake. 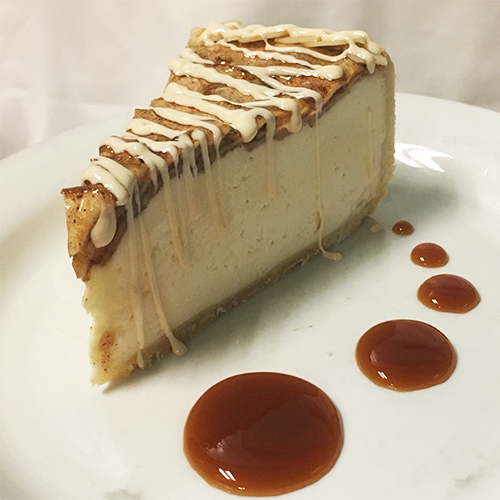 All in all, here at Garry’s Grill, we strive to provide you with your sweet tooth’s desires. So, if there is another dessert you are interested in ordering, do not hesitate to contact our Pastry Chef.